Robby went and had his battery tested and they found that two cells were dead. He decides to replace it in Alice Springs as the range of batteries available was low and the cost high. 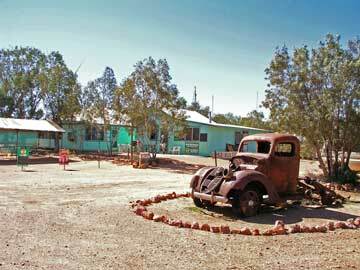 We then drive to the Birdsville Hotel to take a photo. 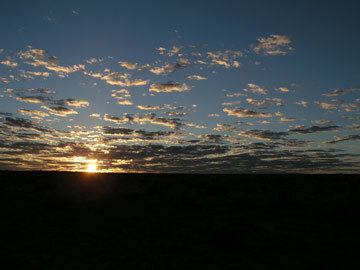 After this we leave town, heading south down the Birdsville Track. We stop near the place where the Page Family died in late 1963. The family of four died when their car broke down and they succumbed to heat and lack of water. We cannot get to where this happened, even though books imply you can. We continue south, stopping just past the Inside Track intersection in a creek bed. We have morning tea here and, at the same time, collect a load of firewood. We put some on the roof of Robby's car and the smaller stuff inside our cars. 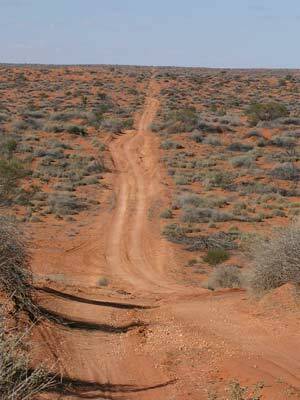 There is not a lot of wood out in the Simpson Desert. 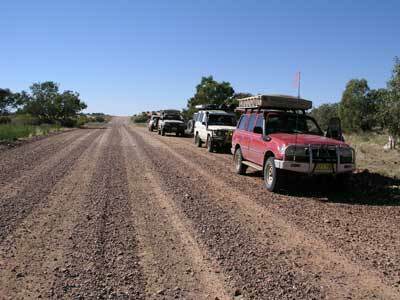 Soon after we turn off the Birdsville Track onto the Warburton Track. We cross the Warburton Creek, the water coming right up over my bonnet. At the stockyards just past here we pass four cars. They are having morning tea and are heading up the Warburton Track. We stop just past here for lunch and they pass us. Back on the road, we pass them when they are having lunch. We hear some others soon after talking on the UHF radio, they are heading south but we do not see them. We turn left soon after and are now on the Rig Road. We go straight over a very big dune. 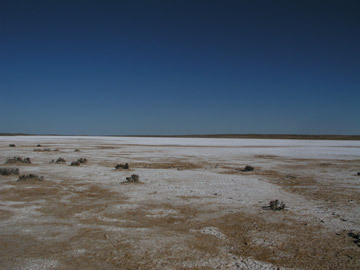 There are quite a few in a row (some with clay pans in between) before we turn north and skirt a very large salt pan. We stop for a look and taste the salt dried on the surface. Back on the road, we go right around this pan and then another even larger one. We go around the top (north end) and over a few dunes. We stop for the night at the top. Dinner was a BBQ, steak and sausages. We depart early and head along the Rig Road. We pass a car parked on the side of the road about one hour later. 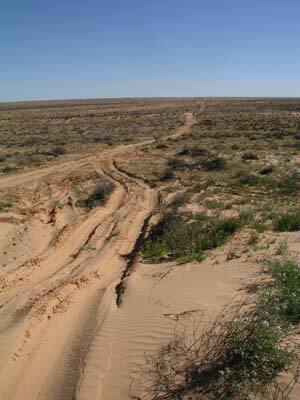 The road varies from running roughly north-north-west in between dunes to due west over the dunes. The in between dune sections are much better in quality and we average over 40 kmh. However, when we travel west the speed drops dramatically. We average about 15 to 20 kmh on these sections. I have not reduced the air pressure at all and some dunes I have to make a second go to get over. However, they are all fairly easy. There are more salt pans to come and we go around the north side of these. At about 10 am we are heading down the western side of one when we stop for morning tea. After this we head west for about 26 kilometres before it turns south-south-east. About 5.8 kilometres down this track we come to the Lone Gum Tree. 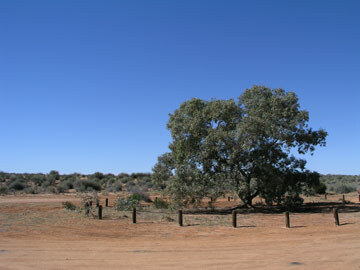 This is the only large tree left in the Simpson Desert. It is not really a gum tree, but an acacia (as far as I remember). Its GPS Reading is S26° 28' 33.0" E137° 23' 18.0" using WGS84 as a datum. It would be a nice spot to camp. Later on we pass a group of four cars and then one car heading east. After heading roughly south for 17 kilometres the road turns west again. These sections are perfectly straight. This one runs for 47 kilometres and we average a bit over 20 kmh. We stop about 1:20 pm and have lunch on the side of the road. Along the Rig Road so far we have seen little wildlife. The only thing we have seen are some bustards, a few camels, some birds and that is all. No kangaroos and no emus. We continue on and then head north-north-west again in-between the dunes. 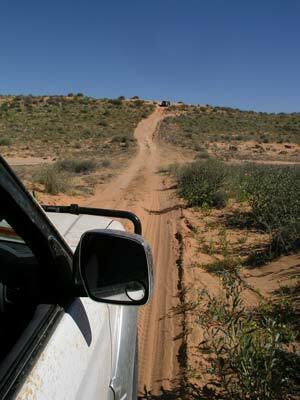 The road heads roughly straight for 17 kilometres, although it crosses over a dune or two every few kilometres. It then goes west for two kilometres and then north again for 15 kilometres. This is the Colson Line. It is a similar track to the Rig Road. 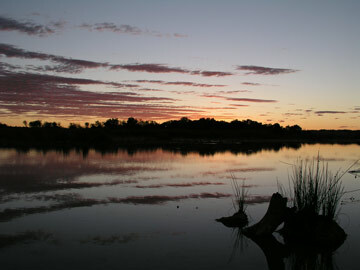 We turn left and head west for 36 kilometres before it heads north-north-west again for about 13 kilometres. Around the turn there is an old abandoned oil well and an airstrip. These were built in the 1960s when the oil exploration was underway. All these tracks/roads were built for that work. Once again, this section crosses over the dunes a few times about half way along. The next intersection is with the French Line (put in by a French oil firm). We head west. This track is much better. While the whole of the Rig Road has been two wheel ruts, this is a proper track. About 30 kilometres down the track is Purnie Bore. 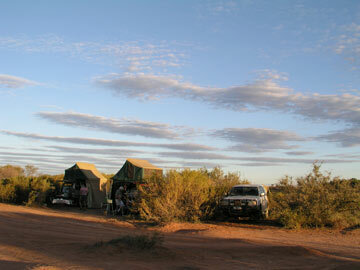 There is a good camping area at Purnie Bore, with a toilet and hot shower (using water from the bore). Purnie Bore is now capped and only lets out a relatively small amount of (hot) spring water. It is now quite shallow. There is not a great deal of birdlife, but lots of dead camels. We see a dingo, it is very skinny. We have a baked dinner, roast beef, potatoes and carrots. It takes 45 minutes to cook, potatoes 35 minutes and carrots 15 minutes. Looks like I have worked this out. At about 3:20 am a very strong wind blews up, almost gale force. A couple of times I have to get up and tighten our tent pegs. This wind continued all day. We leave just after 8 am and two hours later we arrive at Dalhousie Springs. 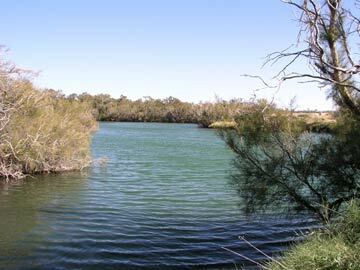 This is about 64 kilometres from Purnie Bore. The track is not too bad but some spots are quite rough. At Dalhousie the wind is so strong that dust is blowing everywhere. There are lots of cars here. It would be a nice spot to camp if there was no wind. 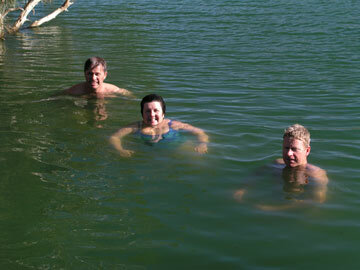 Some of us go for a swim, fantastic, the water is perhaps 38°C. It is very cold when we get out due to the wind. We have morning tea here, but need to put on our beanies, jackets and gloves. We decide that it is too windy to stay here. We were going to stay all day and camp the night but it is very unpleasant. We make the decision to go onto Mount Dare. This is a homestead for the Mount Dare property. It has a bar, a small store, a camp site and, more importantly, fuel. We have lunch here. I have a pie, great after the last week's food. We get fuel here as planned. This is the only fuel available between Birdsville and Alice Springs. We have travelled 779 kilometres since we left Birdsville and I still have one quarter in each of the two fuel tanks. They hold a total of 159 litres, meaning there are about 40 litres left, enough for almost 300 kilometres. The fuel is $1.35 a litre. This is compared to around $0.80 a litre when we left Sydney! I only purchase 60 litres and add the 22 litres from the jerry can I am carrying. This will give me a range of over 800 kilometres at a minimum, more than enough to get to Alice Springs. While we are refuelling we notice that Les has a leak from his front diff. The homestead has a mechanic and when the LandCruiser is lifted up, it is noticed that some of the bolts on the diff are loose. Presumably they have worked loose after the repair. They are tightened and oil is added. There are thousands of galahs all over the place. 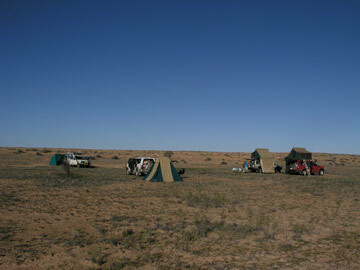 We decide to camp here as there is no other place north that we know of and the wind is still blowing. It costs $12 for two people. 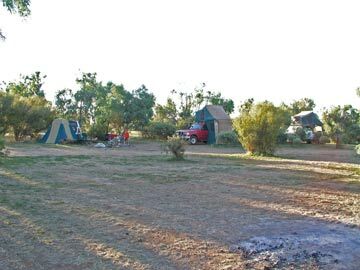 It is a very nice camping area, mostly grassed and there are hot showers run by a donkey boiler into which you feed small bits of timber. We go to the bar and have three beers before dinner, $4 each (MB). Dinner is steak, sausages, pasta and carrots and a good camp fire. Temperature maximum of 15C. The wind finally drops later.